From its foundation in 1348 under Edward III music, through the daily observance of the Divine Liturgy, has played a key role in the life and character of the College of St George. The College Statutes of 1352 provided for thirteen priest vicars, four clerks and six choristers for the choir. One of the vicars was appointed as Instructor of the Choristers to teach the boys Latin and the liturgy. Demands on the choir were great. Out of the eleven daily choral services (eight Hours of the Office and three masses), every vicar and clerk was required to attend no fewer than eight. The Chapel very early on attracted the talents of several well-acclaimed musicians. Canons included the composer, John Aleyn (1362-73), and the prominent composers of the Chapel Royal of Henry V and Henry VI, Thomas Damett (1431-6) and Nicholas Sturgeon (1442-54). The musician and composer, Walter Lambe, was made Instructor of the Choristers in 1479. John Plummer, the principal mid-15th-century composer was also part of the College, employed nominally as virger. Throughout the 15th century St George’s Chapel helped lead the way in this country in developing, alongside the plainsong tradition, a repertoire of polyphonic music. 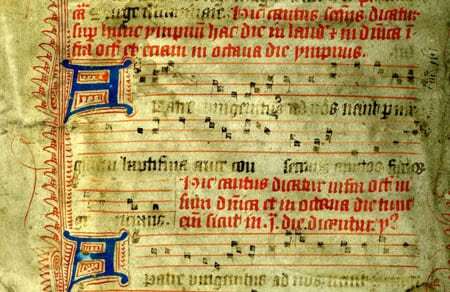 Canon John Aleyn (1362-73), creator of a complex motet, bequeathed to the Chapel a roll of polyphonic music, and in 1417 the Precentor paid for fifteen skins of vellum to make a new book of polyphony [SGC XV.56.23]. Edward IV’s late-15th-century endowment of the College brought about a change in the music more than equal to the scale and grandeur of the newly-planned Chapel. The choir was increased from twenty three singers to forty five in 1482, and the Horseshoe Cloister built (1478-81) to house the vicars. In what was for a time the schoolroom and also living quarters of the choristers (now No. 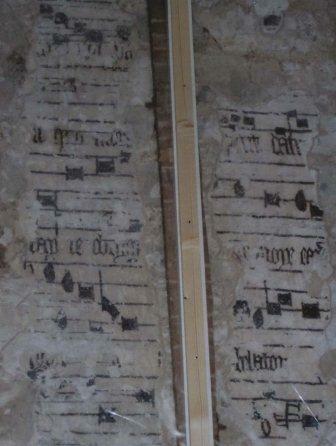 25 The Cloisters) is a fragment of wall-painting from c.1470s depicting a line of musical notation intended clearly as a teaching aid to the boys. The choristers were paid according to the number of services attended, and among the special payments made to choristers for funerals, obits and Garter services was “spur money”, a fine which the boys could levy upon any person found wearing spurs within the Chapel. Both Henry VII and Henry VIII paid the fine, the latter on several occasions. The Archives and Chapter Library contain a number of manuscript part books and organ books prepared for the choir, ranging in date from the Restoration of the Monarchy to the late 19th century, in addition to collections of music deposited by past organists, lay clerks, choristers and others. 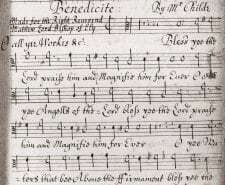 This music continues to be used in Chapel services, continuing the traditions of the last 650 years.